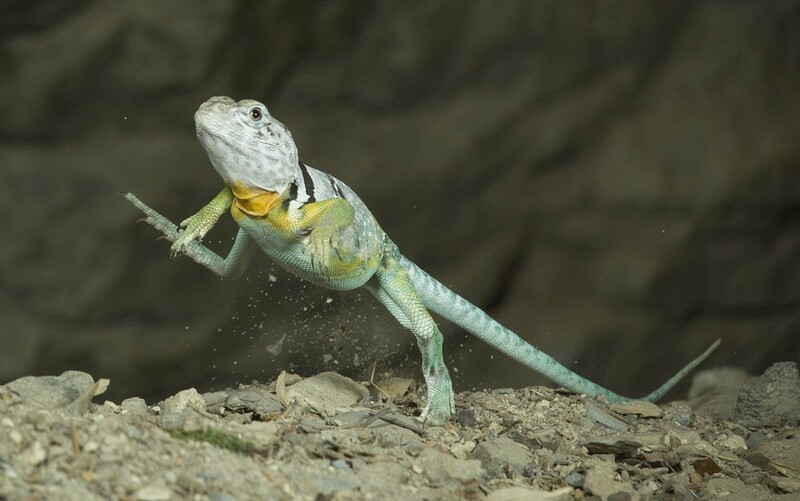 I’ve always loved reptiles and the collared lizard of the American southwest has always been my favorite, perhaps because this lizard often runs on its hind legs, reminding me of a Tyrannosaurus Rex. 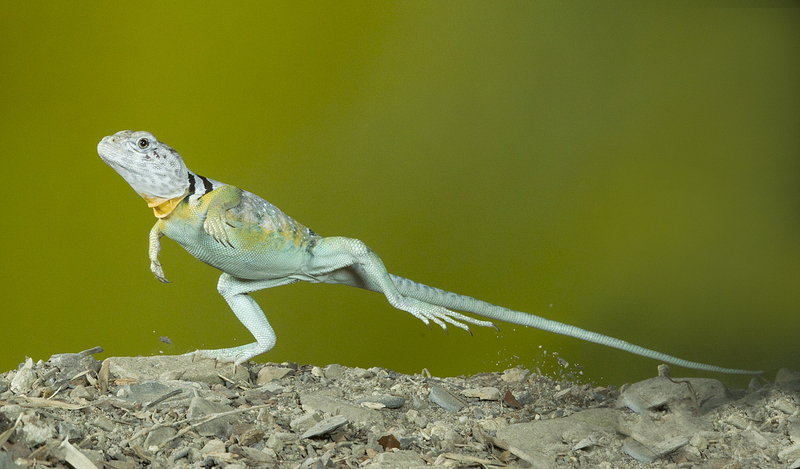 I’ve seen this lizard in the wild several times, but I’ve never seen one run, and I suspect capturing a great shot of one in the field would be impossible for me, especially since I live thousands of miles from their native habitat. Fortunately I had access to a display specimen from a zoo, allowing me to attempt to get this shot under studio conditions. Even then, however, it was a difficult photo to make, and required some very special equipment. Getting the lizard to run was a challenge, and running in the direction I wanted was another. Often the lizard would simple scurry along on all four legs rather than race along on its back legs. To ensure sharp focus I did not trip the camera manually but instead I used two Range IR infrared triggers wired to a StopShot which was attached to an external high-speed shutter. This system triggered both a slave flash, which fired a bank of five Einstein 640 flashes, and my camera. If this sounds a bit complicated or involved, well, it is! The Range IR triggers tripped my camera system when the lizard broke one or both infrared beams, and the high-speed shutter eliminated the annoying lag-time of the normal digital camera, which can be as long as 1/10th of a second in some cameras. I’ve photographed striking rattlesnakes in studio where the camera’s response time was so slow that the snake struck and returned to its coiled pose before the camera fired. Before a high-speed shutter was available, getting a snake in a full, wide-open mouth, scary-as-heck pose was a real effort, and is now much easier to do with the external high-speed shutter. I used a BH-55 ballhead to support this rather heavy rig, consisting of a 70-200mm/f4 lens and camera, external shutter and control console, and StopShot control module, while the ballhead still gave me the flexibility to pan or tilt to get the exact framing I desired. An essential accessory for the high-speed shutter rig is the Mini-clamp package, with a B2-FAB, since the shutter rig involves a dovetail rail for positioning the camera. All of this was mounted to a Versa TVC-24L tripod with a TA-2-LB leveling base for more control in my framing. While I much prefer to photograph wildlife in the wild, some quite interesting behaviors may not be possible that way, especially with the equipment I was using. But in studio, with that specialized gear, I shot my running dinosaur! Joe McDonald is a Wildlife Photographer and Instructor based in McClure, PA.